If you're a fan of Starbucks coffee, then surely you'll love Peet's Coffee. When it comes to coffee, I find that Peet's has better depth of flavor that you don't get at Starbucks. I find Starbucks to be a bit watered down for my liking. Any coffee loving person would agree with me that Peet's is way better. 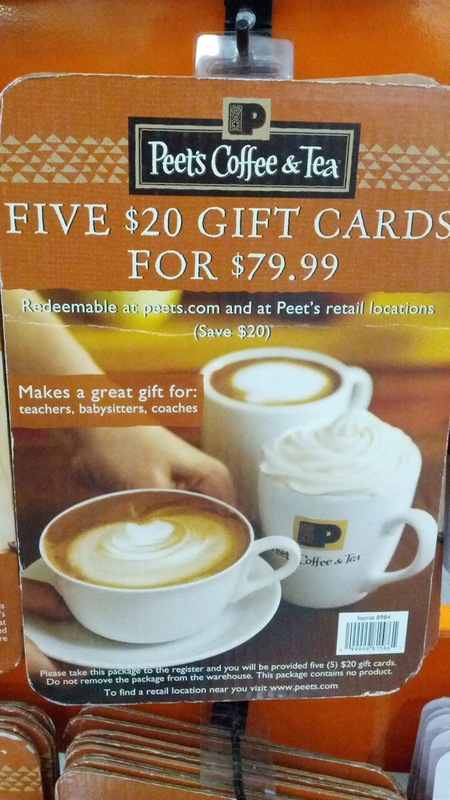 Since I go to Peet's often, I like to take advantage of this deal at Costco where I could save money on my daily coffee fix by buying Peet's gift cards. That and these gift cards are great for giving out to any coffee (or tea) drinking person as gifts: birthdays, graduations, Bar Mitzvahs, stocking stuffers for Christmas, etc. It goes to show that not all good coffee comes from Seattle, WA. Since 1966 in Berkeley (located in the San Francisco Bay Area), CA, Peet's Coffee & Tea has offered superior coffees and teas by sourcing the best quality coffee beans and tea leaves in the world and adhering to strict high-quality and taste standards. Whether you enjoy espressos, cappuccino, lattes, tea, or you just like your coffee black, then you won't regret getting your coffee from Peet's.